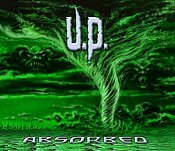 If you're unfamiliar with the work of UP, their latest EP is a great place to start familiarizing yourself with both their past and their present. Comprised of a new track, a couple of leftovers from the sessions for their previous effort (the outstanding Mindfailure), and a new take on a cut from "the closet", Absorbed has a sound rooted in straight-ahead power metal mixed with progressive elements through complex tempo shifts and intricate guitar-work, all courtesy band mastermind and songwriter Ken Jacobsen, and resulting in some of the best stuff in this genre today. Although culled from different eras in the band's history, and featuring two different vocalists and bassists, Absorbed is a surprisingly cohesive collection that impresses from start to finish.